A River Island blue cropped sweater and blue ripped boyfriend jeans is a savvy combo to add to your casual repertoire. Got bored with this outfit? Enter yellow leather pumps to jazz things up. 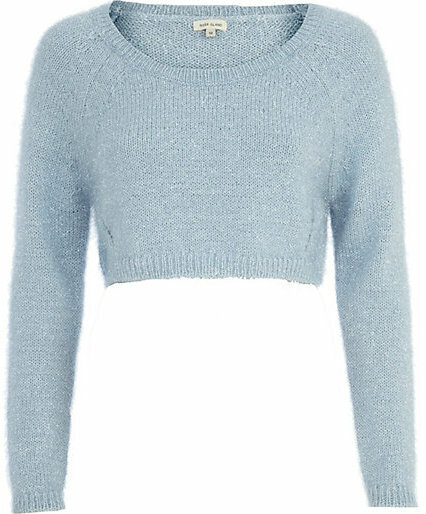 If you're obsessed with relaxed dressing when it comes to your personal style, you'll love this extra cute pairing of a light blue cropped sweater and light blue ripped boyfriend jeans. Up the cool of your look by wearing brown leather oxford shoes. If you're scouting for a casual yet totally chic getup, consider pairing a River Island blue cropped sweater with a white and black geometric full skirt. Both pieces are totally comfy and will look fabulous paired together. And if you want to instantly amp up the style of your look with one piece, enter black leather pumps into the equation.